There's nothing like a slice of fresh apple pie. Or is there? These yummy bars taste like delicious apple pie, but they have a secret. Those aren't apples inside - they're zucchinis! This recipe is awesome for several reasons. Most importantly, these bars taste great! They also help use up some of those prolific squash from the garden. And, of course, this is a perfect way to get some veggies into stubborn kids. Another benefit is that it allows people who are allergic to apples to enjoy this classic flavor combo. At my house, this translates into one happy husband! 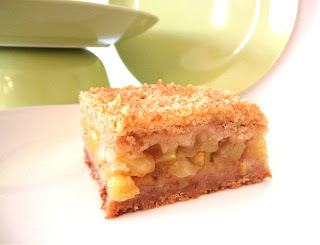 These bars are adapted from a recipe at Taste of Home. They're a tasty and wonderful end of summer dessert! 1. Preheat the oven to 375°. Line a 9"X9" baking dish with parchment paper. Set aside. 2. For the Filling: place the zucchini in a large saucepan with the lemon juice. Place the pan over medium-high heat. Cook, stirring often, until the zucchini is tender (about 10 minutes). 3. Meanwhile, stir the sugar together with the cinnamon, nutmeg, allspice, and salt in a small bowl. 4. Once the zucchini is tender, sprinkle the sugar mixture over the top. Stir to combine and bring the mixture to a boil. Cook for an additional minute. Remove the pan from the heat. 5. For the Crust: put the flour, sugars, and cinnamon in the bowl of a food processor. Pulse to mix well. Sprinkle the butter pieces over the top. Pulse until the mixture turns into coarse crumbs. 6. Pour half of the crust mixture into the prepared dish. Press the mixture firmly and evenly into the bottom of the dish. 7. Pour the filling over the the crust. Spread into an even layer. 8. Sprinkle the remaining crust mixture evenly over the top of the filling. 9. Bake the bars for 30-40 minutes or until the top is golden brown. 10. Transfer the baking dish to a rack to cool. Slice into bars. Serve!